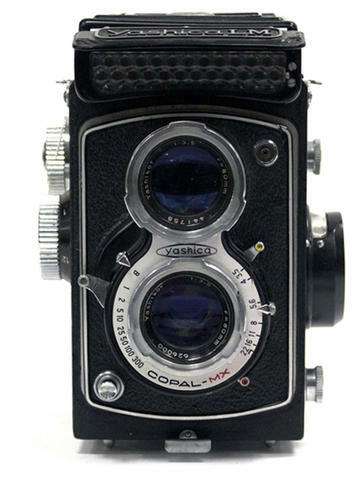 Item is a typical medium format twin lens reflex camera, designed to resemble a Rolleiflex. The "LM", for light meter, indicates that this model has a selenium cell exposure meter on top, with meter control on left side. Shutter: Copal MX. 80mm f3.5 Yashicor Lens. The item displays some brassing of metal components. The waste level finder is misaligned. The cold shoe is missing. Donated to Wilfrid Laurier University by Adolf Bogad.